Guernsey FC manager Tony Vance says his side's decision-making contributed to their 2-1 loss to Folkestone Invicta in the Isthmian league Division One South. The Green Lions went ahead through Ross Allen, following a one-two with Spanish midfielder Guille Fernandez. Jordan Wright's brace gave Folkestone the win, though there were suspicions of handball for his equaliser. "Ultimately when we have the ball perhaps we've got to make better decisions," Vance told BBC Guernsey. "We can keep hold of the football better at times and protect it better in certain areas. "It (Invicta's first goal) looked like a handball to me to be be fair, but the referee made a decision on what he saw." 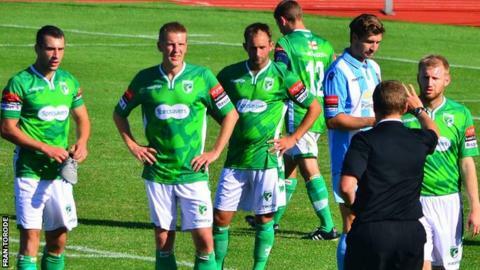 The defeat was Guernsey's first of the season and their opponents' first victory on the island. It maintains Folkestone's 100% start to the campaign, a record matched only by Herne Bay. "While they're a good side they're pretty predictable, but they're also pretty good at it," added Vance. "So we knew how they were going to play, but unfortunately we couldn't quite hang on in the end."